Humans may have originated near rivers – Technology & science – Science – LiveScience – msnbc.com – neither savanna nor jungle, beach (river banks) was the favored ecosystem even for old good Ardi, it seems. Pileta de Prehistoria: 180 prehistoric sites located around Atapuerca[es] – not just Neanderthal ones: a bit of everything (located just outside Burgos city, Atapuerca is a key pass between the Upper Ebro basin and the Northern Iberian Plateau, which must have played an ecological and socio-political role always, and hence attracted people towards it). ScienceDirect – Journal of Human Evolution : Stratigraphic and technological evidence from the middle palaeolithic-Châtelperronian-Aurignacian record at the Bordes-Fitte rockshelter (Roches d’Abilly site, Central France) – refines the dating for Chatelperronian (PPV paper). Exceptional discoveries at Mas d’Azil – La Gazette Ariégeoise[fr] – not much info provided however. Remains found of the culture which inhabited Northern Chile 11,000 years ago – Terrae Antiqvae[es] – they exploited a quartz deposit for their tools in the middle of Atacama desert, which then was probably quite milder. Divers retrieve prehistoric wood from Lake Huron – from 8900 years ago. Simultaneous ice melt in Antarctic and Arctic at the end of the last Ice Age. Pileta de Prehistoria: businessman Victorino Alonso on trial for destroying a Neolithic cave in Aragon[es] – I asked for death penalty back in the day. El Neolítico en Europa: una simulación del proceso | Neolítico de la Península Ibérica – Iberian Neolithic – exposition and criticism in Spanish language of yet another paper simulating the Neolithic ‘colonization’ (Lemmen 2011). 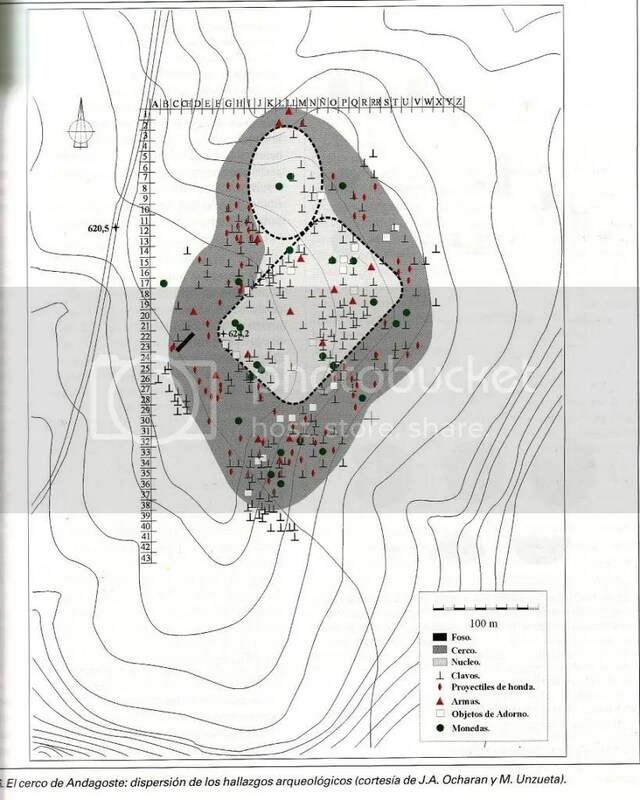 Iruina blog: doubts about the ability of the Basque Autonomous Police to analyze the Iruña-Veleia pieces[es] – the Spanish Guardia Civil police force already declared themselves unable to do the tests. The defense asks to send the remains to one of the few international laboratories able to do the tests and has even offered to pay the cost of it. Also at Diario de Noticias de Alava[es]. An intimate look at ancient Rome – OregonLive.com – a journey through the hygienic practices of Ancient Rome. Scientists unlock the mystery surrounding a tale of shaggy dogs – Native Americans used dog hair for textiles (among other components). The Archaeology News Network: Real Mayan apocalypse may have been their own fault -overexploitation of the jungle biome caused desertification. Some of these open access papers surely deserved a deeper look at… I did not have time or energies for that however. 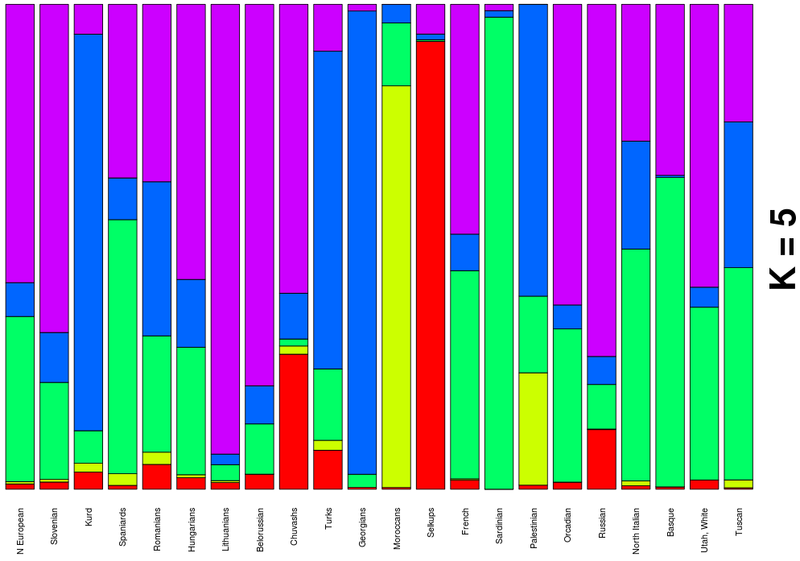 PLoS ONE: Population Structure and Genetic Diversity in a Rice Core Collection (Oryza sativa L.) Investigated with SSR Markers – rice genetics and possible origins. 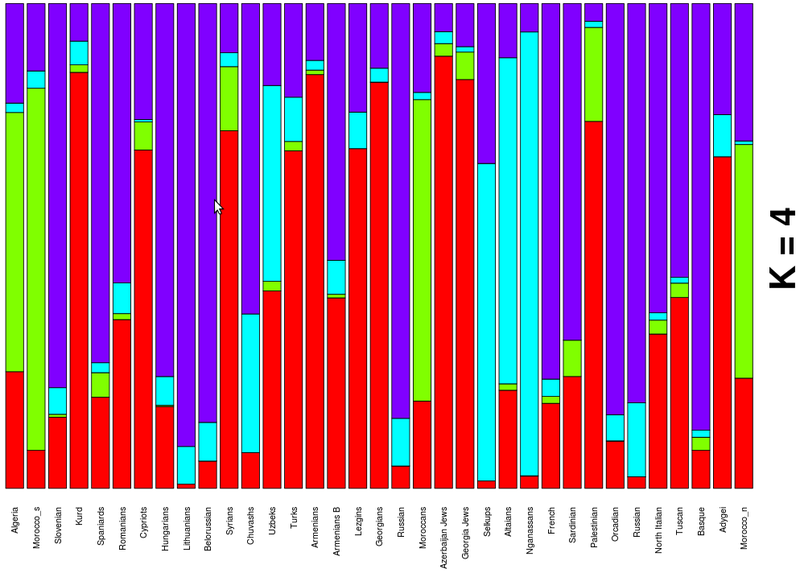 PLoS ONE: The Local Origin of the Tibetan Pig and Additional Insights into the Origin of Asian Pigs – pig genetics. BBC News – Liking a lie-in in people’s genes, researchers say – long sleeping is a genetic need: tell your boss next time you are late. I am among those who need to sleep 9-10 hours per day (normally) though I have also met people who only sleep 4-5 hours. The Spittoon » Find Your Inner Neanderthal (I retract what I said before: the results are coherent, even if Africans still get too much too often I guess that’s part of the margin of error. However there is another “free online” genetic test that is misleading). Of mice and men, a common cortical connection – a nice comparison to better understand brain regions. To the right: F/M: frontal/motor cortex, S1: primary somatosensory cortex, A1: primary audtive cortex and V1: primary visual cortex. Mice have a much more developed somatosensory cortex (surely related to whiskers, smell, etc.) but a much less developed frontal/motor cortex (related to willpower and rationality). Brain Scans Reveal Difference Between Neanderthals and Us | LiveScience – something about the sense of smell, not too clear. Primates are more resilient than other animals to environmental ups and downs – diversification and flexibility is the key to long-term success. Or should I say Caristian territory, year one of the Hispanic Era? Actually it was probably the year before or maybe even two years earlier: 40-39 BCE according to the best estimations but the case is that a battle took place in the municipal territory of Kuartango, not far from Vitoria and Bilbao and the ancient city of Veleia, where many Basque and Vulgar Latin short inscriptions have been found. 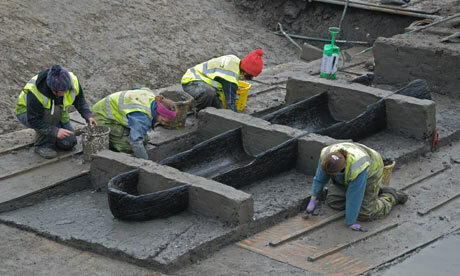 I was totally oblivious to this historical-era archaeological episode until I read about it yesterday at Iruina[es] blog and then at Euskonews[es] (dated in 2006). It seems that some 1500 Roman legionaries (1200-1800, known by the size of the defensive castrum erected) were attacked and defeated by local tribal troops in what was the prelude to the Cantabrian Wars, a decade later. While this prelude is poorly known to historians it must have been of some importance because Octavian (Augustus) declared the year 38 BCE as the first one of the Aera Hispanica, a chronology that was used in all Iberia (i.e. Hispania before the name was monopolized by the state of Spain) until the Late Middle Ages when the more cosmopolitan Christian calendar began to be used instead. And he did so because of the victories that he allegedly attained against the tribes of the North, campaigns of which little is known. In that year of 38 BCE is known that M.V. Agrippa quelled an uprising by the Aquitani (Northern Basques and proto-Gascons). We can I guess speculate if this battle was caused by (or even cause of) the campaigns of Octavian in the South or that of his commander Agrippa in the North but I can only imagine that this is a trivial distinction and that both are one and the same crushing pressure of the Roman Empire against the Basque tribes overall. The battle brings to question the myth of Southern Basques being submitted by Rome only or mostly by pacts and agreements. This myth is mostly based on the fact that Pompey camped at what is now Pamplona (Pompaelo) while his rival Sertorius (a supporter of Marius) did in Huesca (Osca), at the final showdown of the Sertorian War. However at that time the Romans battled with many diverse and circumstantial allies, alliances that might have been eroded by the time of this battle. Alternatively, different tribes may have held different relations with Rome and what applies (maybe) to the Vascones needs not apply to the Caristii or other tribes of North Iberia and Aquitania. The nails (clavos) are more than 600 used for caligae (military footwear), indicating where Romans lost a sandal and maybe their lives. 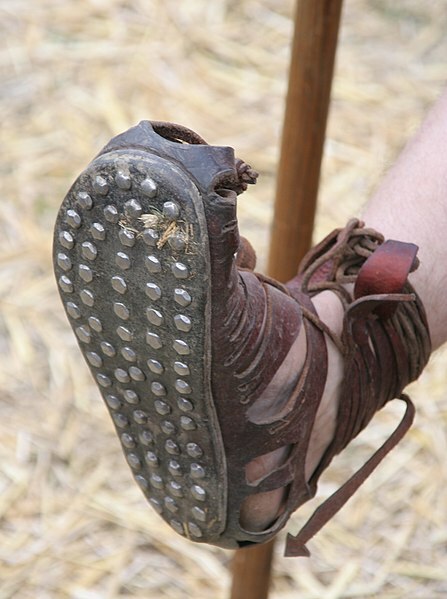 The coins (monedas), weapons (armas) and slingshot ammunition (proyectiles de honda) may help give an impression of the details of the battle in and around the central fortification (núcleo) and also tell archaeologist of when the battle took place (for example these large shoe-nails were replaced by smaller ones in the Roman legions a few years later, the coins also allow for a quite precise estimate…) The overall estimate seems to be 38 BCE (+/-3 years) but the most exact claims are for the 40-38 BCE period in fact. 27 BCE: Octavius becomes Augustus (standard beginning of the Roman Empire, previously known as Roman Republic). 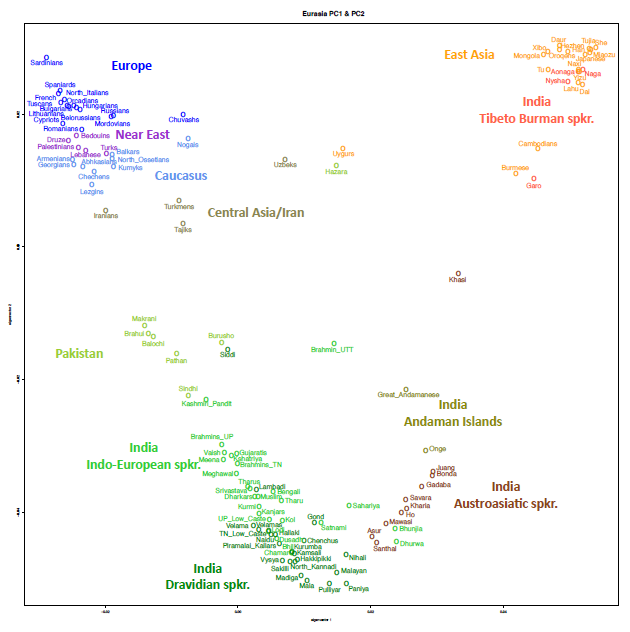 30% of SNPs found in Indian populations were not seen in HapMap populations and that compared to these populations (including Africans) some Indian populations displayed higher levels of genetic variation, whereas some others showed unexpectedly low diversity. 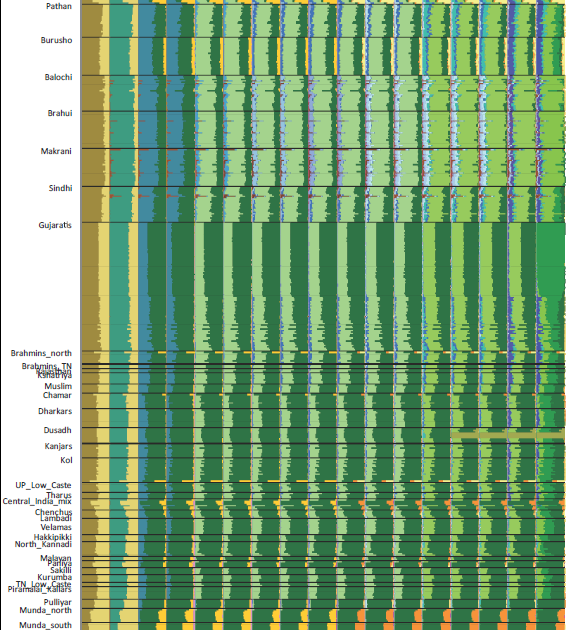 Reinforcing the generally acknowledged notion that India hosts very large, albeit largely untapped, genetic diversity. It may get a bit more interesting when they analyze the equivalent of Reich’s Ancestral North/South Indian components (ANI & ASI), around which much speculation (sometimes quite wild) has built up. These two components are apparent at both the PC analysis (PC2 and PC4) but maybe more clearly within the ADMIXTURE cluster analysis. The authors decided to use K=8 where I would have used K=13 (preferred by the combination of both check algorithms shown at Supp. Fig. 4 b and c) but the result is only different (for this purpose) in the inclusion or not of Caucasian populations in the ANI-equivalent component (k5 in the maps below). Iranians are always included, as are Central Asians but quite less emphatically anyhow at K=13 than at K=8, as the affinity splits between the Baloch (ANI) component and the Caucasus-specific one. 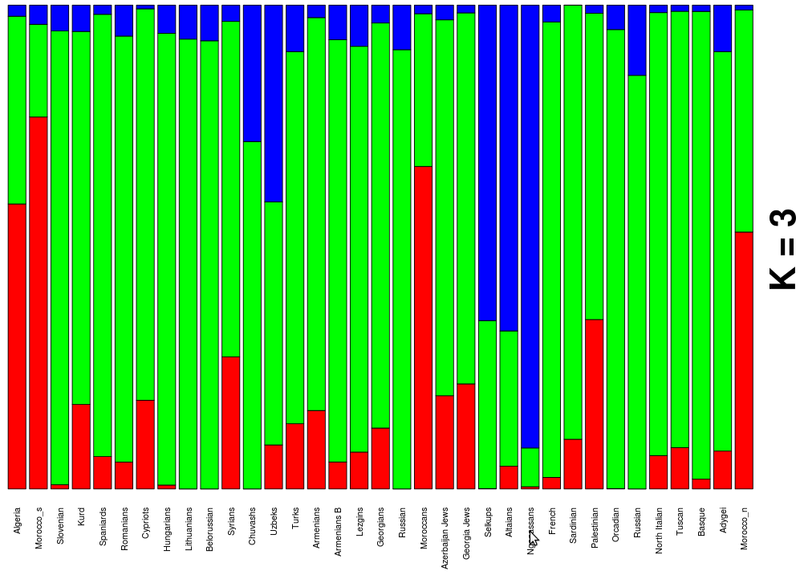 However Russians do not show any Caucasus-specific affinity and show instead strong influence of the ANI component, which seems to correlate well with Y-DNA R1a, specially once the Caucasus affinity is detached at K=13. 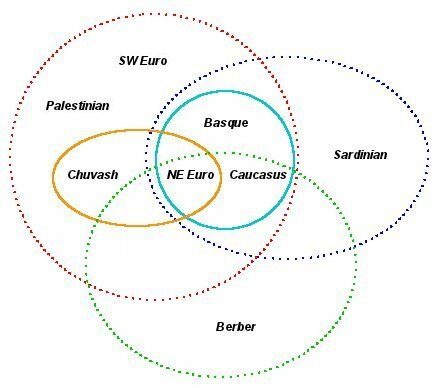 The authors do in fact make an effort to discern if the Baloch-ANI could represent the much discussed Indoeuropean (or Aryan) invasion (hardly doubted in the linguistic plane but not clearly supported in the genetic one). They conclude however that the arrival of the ANI component in South Asia should be much older, at least 12,500 years old, that is: clearly pre-Neolithic – and in any case not related to the Indo-Aryan invasion. I would like to encourage transcending the limitations of the chosen K=8 level of analysis and dive in the K=18 analysis found in the Supplemental Figures’ PDF (fig. 4). 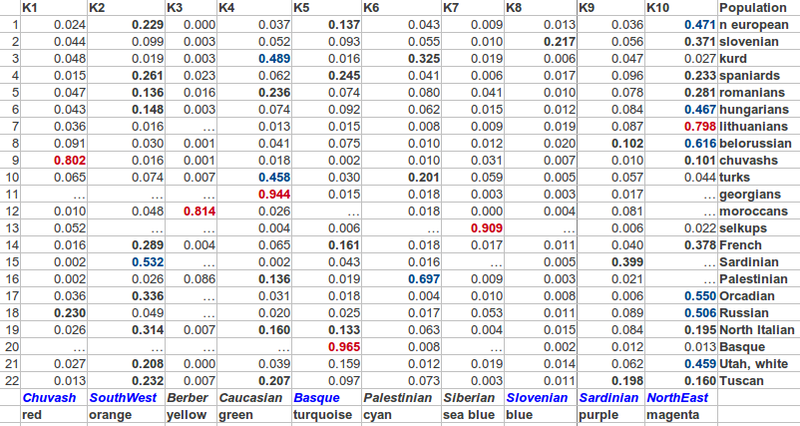 As said before, the optimal level of analysis seems to be K=13 or maybe K=12, rather than the chosen one of K=8. Above K=10 in any case. 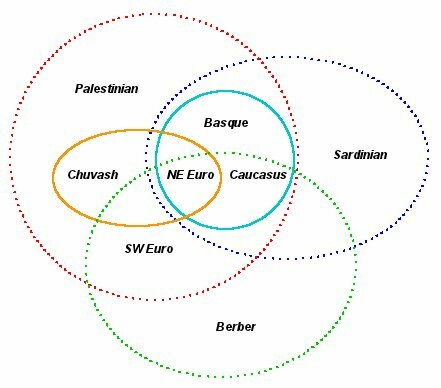 However many of the improvements of greater resolution take place outside of South Asia, so for most purposes there is no difference (other than the inclusion or exclusion of the Caucasus’ populations in the ANI bloc). Something else that I miss here is a regional, South Asian specific (maybe with the inclusion of some West Asian and SE Asian controls), analysis. 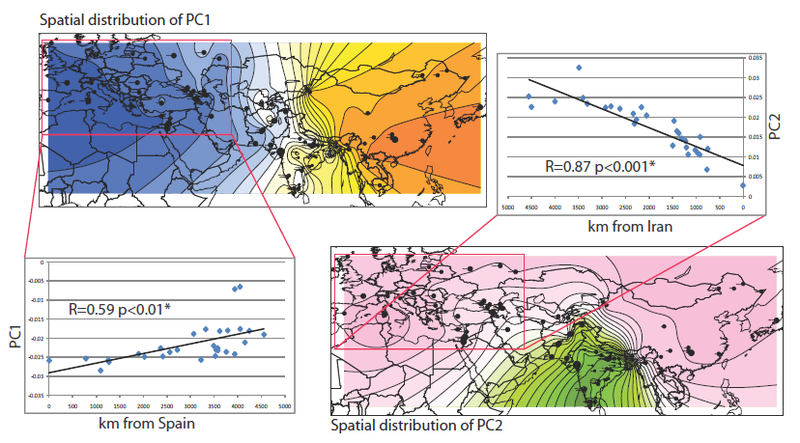 It may have offered interesting insights but it is just outlined, with just four South-Asian-specific components at K=18: more than enough for the pan-Eurasian analysis but surely quite limited to discern the details of population structure in South Asia alone. 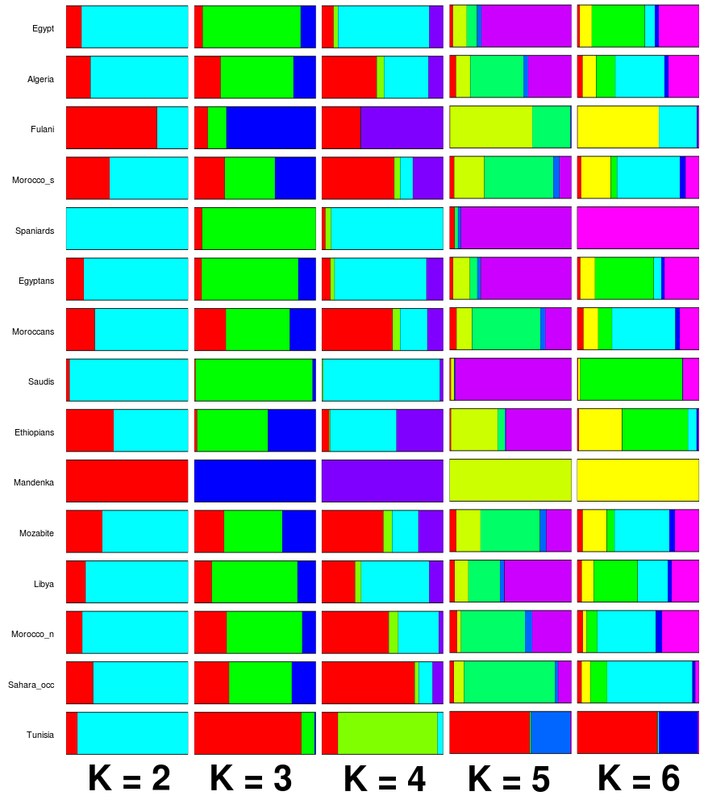 One of the most specific findings of this survey is the detection of a group of alleles (at genes DOK5, CLOCK) that have been apparently selected for in South Asians but that has become harmful as diet and lifestyles change today, favoring type 2 diabetes. This is a very interesting paper not because it offers any new striking discovery but because it brings to doubt previous ones and highlights the difficulties in demonstrating beyond reasonable doubt the functional selection in genes allegedly involved in pigmentation, which is one of the most clear differential adaptions among humans. 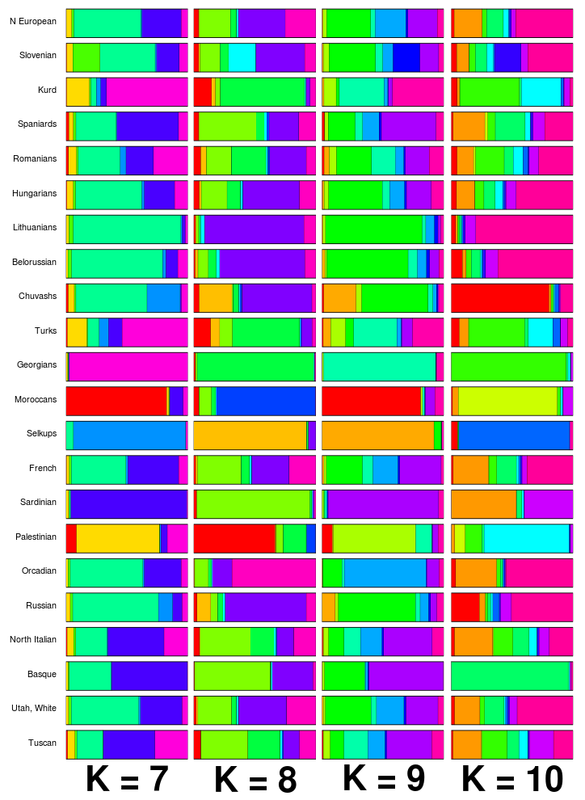 Johanna Maria de Gujter et al., Contrasting signals of positive selection in genes involved in human skin color variation from tests based on SNP scans and resequencing. Investigative Genetics 2011. Open access. Importantly most of the discoveries challenged were made by the same team, what is a outstanding example of scientific commitment and self-criticism. Casting doubts and reducing certainty may not be what makes a Nobel Prize but it is how Science advances in fact. 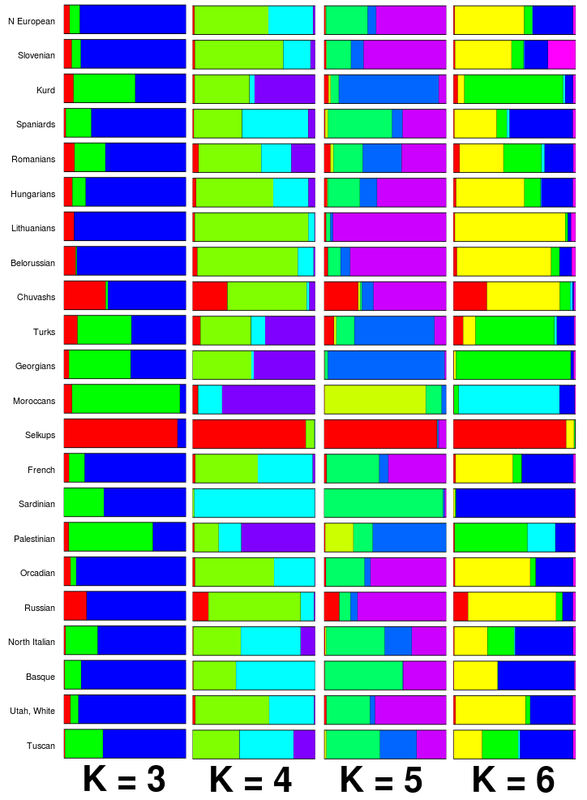 Numerous genome-wide scans conducted by genotyping previously-ascertained single nucleotide polymorphisms (SNPs) have provided candidate signatures of positive selection in various regions of the human genome, including in genes involved in pigmentation traits. However, it is unclear how well the signatures discovered by such haplotype-based test statistics can be reproduced in tests based on full resequence data. 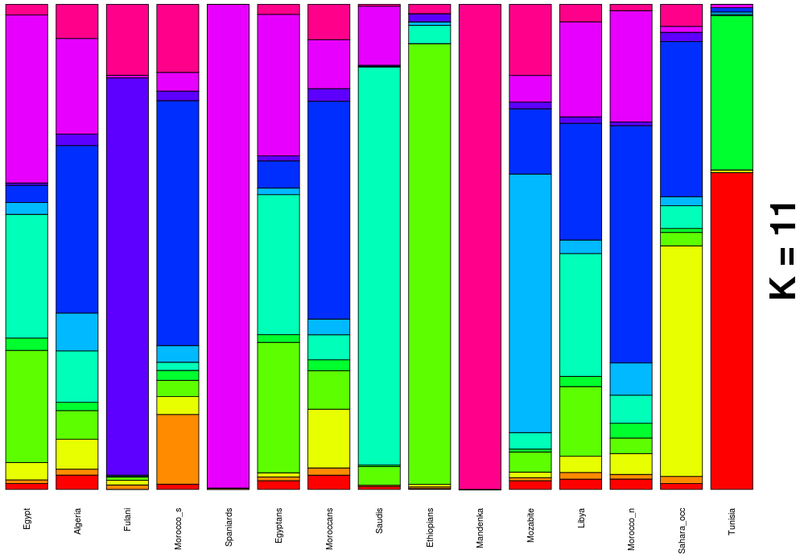 Four genes, OCA2, TYRP1, DCT and KITLG, implicated in human skin color variation, have shown evidence for positive selection in Europeans and East Asians in previous SNP-scan data. 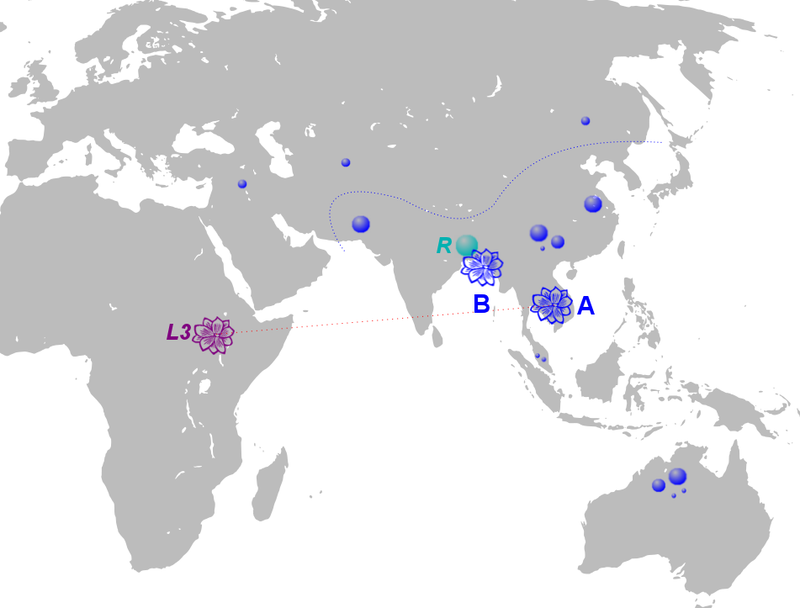 In the current study, we resequenced 4.7-6.7 kb of DNA from each of these genes in Africans, Europeans, East Asians and South Asians. Applying all commonly-used allele frequency distribution neutrality test statistics to the newly generated sequence data provided conflicting results in respect of evidence for positive selection. Previous haplotype-based findings could not be clearly confirmed. 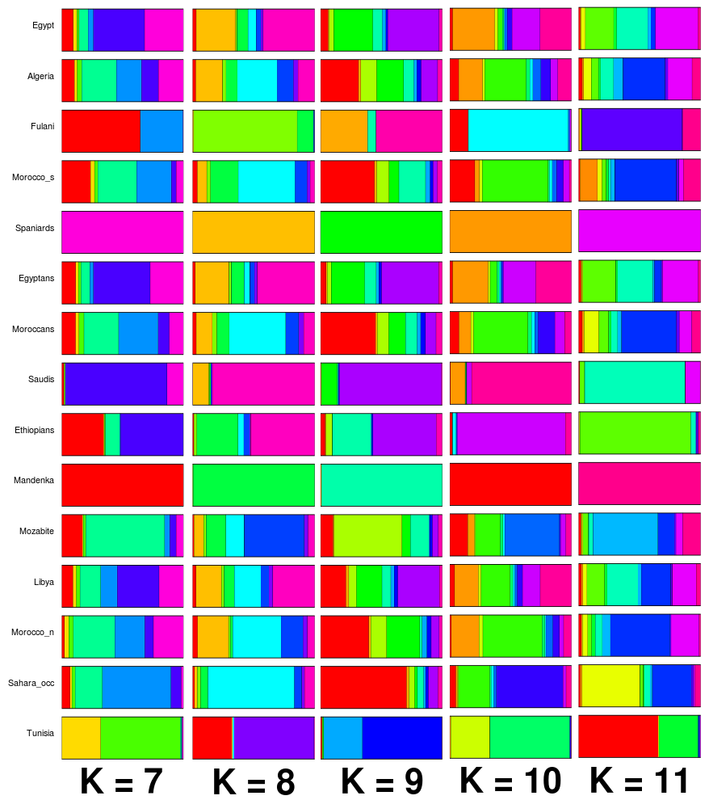 The application of Markov Chain Monte Carlo Approximate Bayesian Computation to these sequence data using a simple forward simulator revealed broad posterior distributions of the selective parameters for all four genes providing no support for positive selection. However, when we applied this approach to published sequence data on SLC45A2, another human pigmentation candidate gene, we could readily confirm evidence for positive selection as previously detected with sequence-based and some haplotype-based tests. 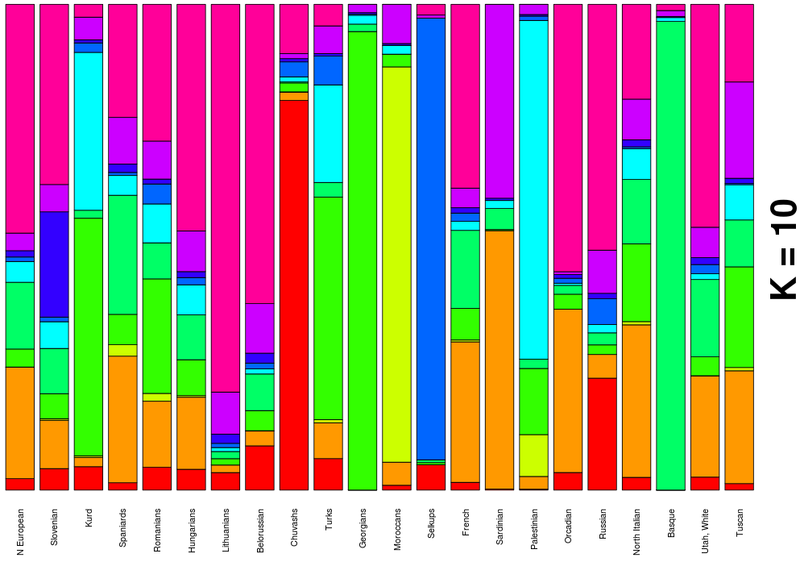 Overall, our data indicate that even genes that are strong biological candidates for positive selection and show reproducible signatures of positive selection in SNP scans do not always show the same replicability of selection signals in other tests, which should be considered in future studies on detecting positive selection in genetic data.